Ty42-24 with its first train of fare-paying passengers after a 4-year overhaul. Photo ©Marek Ciesielski. Everybody wants a view, of Pyskowice’s Ty42. Photo ©Marek Ciesielski. A fun day for the whole family. Photo ©Marek Ciesielski. The heroes of the day, Krzysztof and Zbyszek Jakubina of TOZKiOS. Photo ©Marek Ciesielski. Our thanks to Marek Ciesielski for sharing his superb photos with us. All the images can be enlarged by the simple expedient of clicking on them. 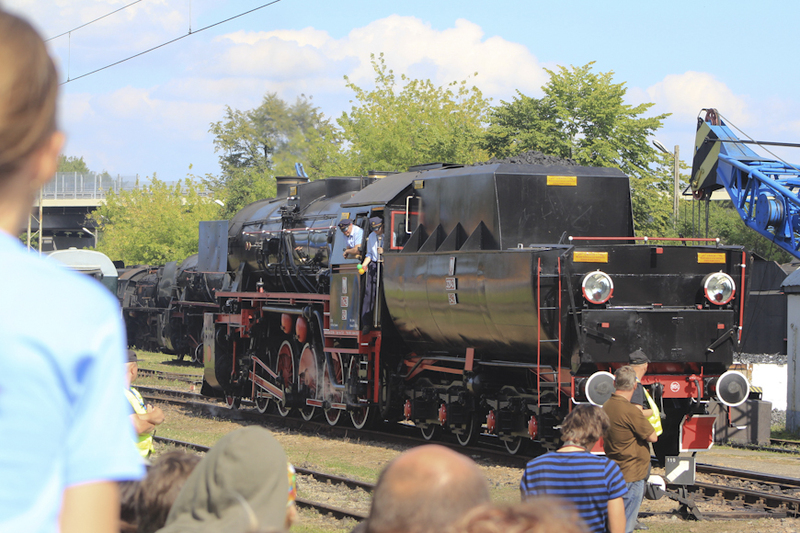 Šlachtična, a powerful mixed traffic 4-8-2 built by Skoda in 1947, will be a star attraction at this year’s Parowozjada. Other locomotives expected to be in steam include Chabowka’s own: Ol12-7, Tkt48-191, Ty42-107, and TKh49-1. Ol49-99 (ex Ol49-69) will be visiting from Wolsztyn. Polish railfans will be looking out for Ty42-24 which has recently completed a four year overhaul carried out by a small team of volunteers at Pyskowice. 2-8-2T, TKt48-191 at Chabowka Station in August 2011. Photo BTWT. Making a welcome return this year are the special vintage trains to bring guests to the gala. These will be running on Saturday 24 August from Dobra k. Limanowej and Zakopane. Ty42-107 is booked to haul the Dobra train, while TKt48-191 is scheduled to work the train from Zakopane. 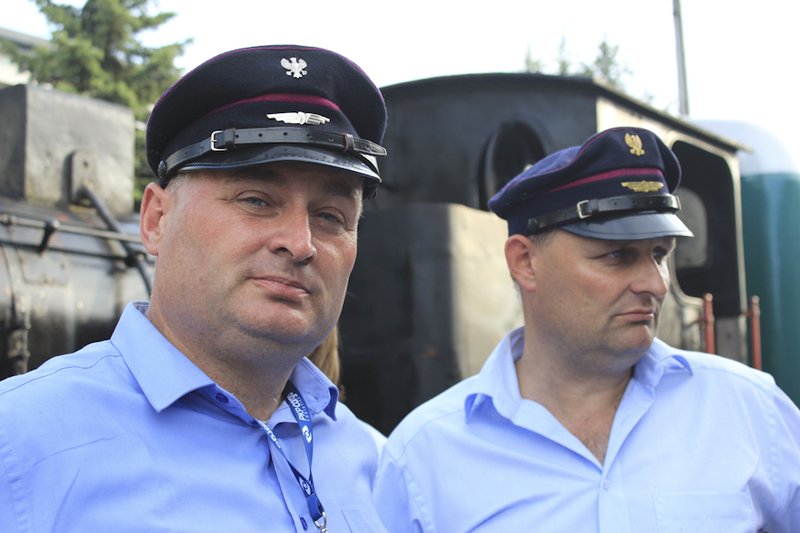 Sadly the special vintage trains which used to bring guests from Cracow have not been running for several years. 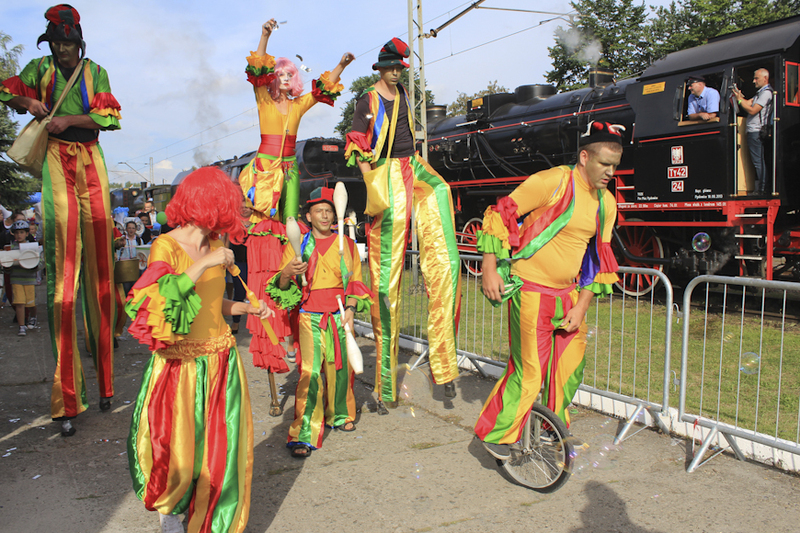 This year’s Parowozjada, the 9th such event, takes place in the Chabowka Skansen (open air railway museum), near Rabka Zdroj this weekend (24 & 25 August). Further details (in English) can be found on Milos Mazurek’s website, see below. Vilnius railway station, Warsaw – St. Petersburg Railway. Photo Arz. Of all of my extraordinary friends Ropucha is the most eccentric. He once bought a waterworks with a view of turning its underground reservoir into a contemporary version of Bilbo Baggins’s home. His enormous Warsaw flat is decorated in the minimalist style of Andy Warhol’s New York Studio. Yet not everything is simple. The huge bath, large enough to accommodate a dinner party, is worked by a TV-like remote. One press and a stream of apparently red-coloured hot water starts to fill the bath, another press and blue cold water spurts out, a third button projects Debbie Harry singing Heart of Glass on the back wall. Ropucha hardly ever visits Warsaw. Ropucha recently bought a yellow sports car, but when I suggested that he might like to give it a quick run on the brand-new motorway and pop in to see me, he replied that it was having an oil change. A couple of days ago he rang me and asked me how I felt about the Baltic States. I got very excited, assuming that he was asking me to come as a co-driver for a quick dash in his shiny new toy to Vilnius, Tallinn and Riga, but in fact was buttering me up to check out some international train services. It seems Mrs Ropucha rather fancies a visit to Saint Petersburg and not wanting to risk his yellow peril on the trip, Ropucha wanted some advice in putting together an interesting rail journey. 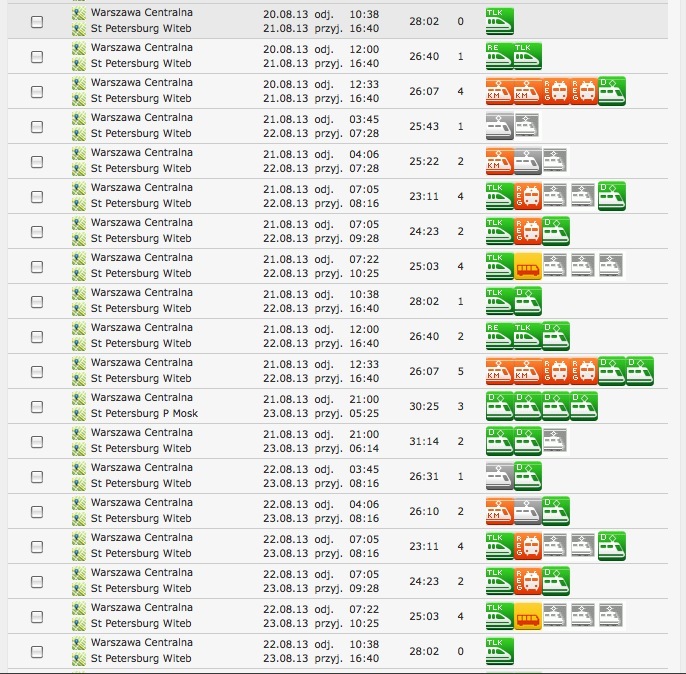 Perhaps Warsaw – Saint Petersburg – Moscow – Warsaw or even a leisurely return run through the Baltic States? Would I conduct some preliminary research? Warsaw – St. Petersburg services. Timetable T K Telekom. A little bit of work on the T K Telekom on-line timetable revealed an every second day train service running direct from Warsaw to Saint Petersburg complete with a romantic sleeping compartments. Just the thing, I thought! But hold on a minute my friend Kret completed the train to China, but opted to do the first leg: Warsaw – Moscow by plane. I rang him and asked him why he had avoided the comforts of the Warsaw – Moscow sleeping cars. There’s nothing wrong with the train he assured me, but he end his wife baulked at paying the transit visa fee of £50 each for the privilege of travelling through Belarus. Setting up the Warsaw – Saint Petersburg journey on Google Maps shows that the shortest route from Warsaw is through Lithuania, Latvia and Estonia. Surely the train journey is routed the same way? Well, it is not. A further check on T K Telekom shows that the train runs through Belarus. Now Ropucha, although quite well off, hates paying the going price for anything, so I could see that he might baulk at paying £200 for four sets of Belarus visas. Perhaps it might be possible to reach Saint Petersburg via the Baltic States? All three countries are Poland’s near neighbours and are in the EU. A short session on Google maps revealed that there is one railway line that connects Poland and Lithuania without crossing the Kaliningrad enclave. However, zooming in on the line shaded as distinctly overgrown especially in Lithuania, while in Poland a road appears to have been built over some of the railway track. I phoned Prezes who knows about all of these things. Is it true that the only direct rail connection between Poland and Lithuania is disused I asked. No, he answered, there is a daily train connection but it does involve two train changes in Lithuania. 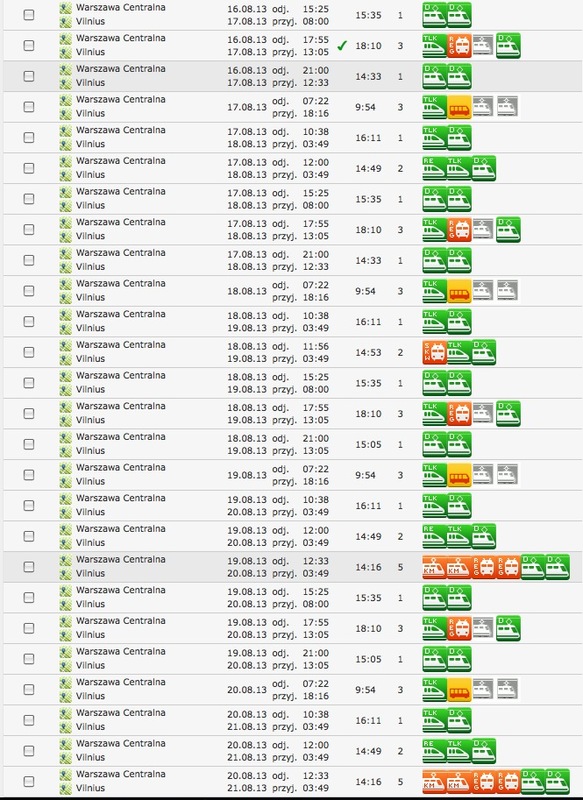 Warsaw – Vilnius by rail? Timetable T K Telekom. Alas no longer! A last visit to T K Telekom sure that the actual border crossing between Poland and Lithuania is carried out by coach. I find this is really amazing. Two neighbouring countries: both members of the EU, with a great deal of common culture and history, and many families living in both countries; yet their capitals – only some 400 km apart – have no direct rail services! Surely providing such a connection should be an EU priority? It is extraordinary that it is easier to travel by rail from Warsaw to Moscow than between Warsaw and Vilnius. Test train reaches Wegorzewo. Photo Szymon Błaszczyk/SKPL. After many vicissitudes, tourist trains are finally running on the Ketrzyn – Wegorzewo railway line. 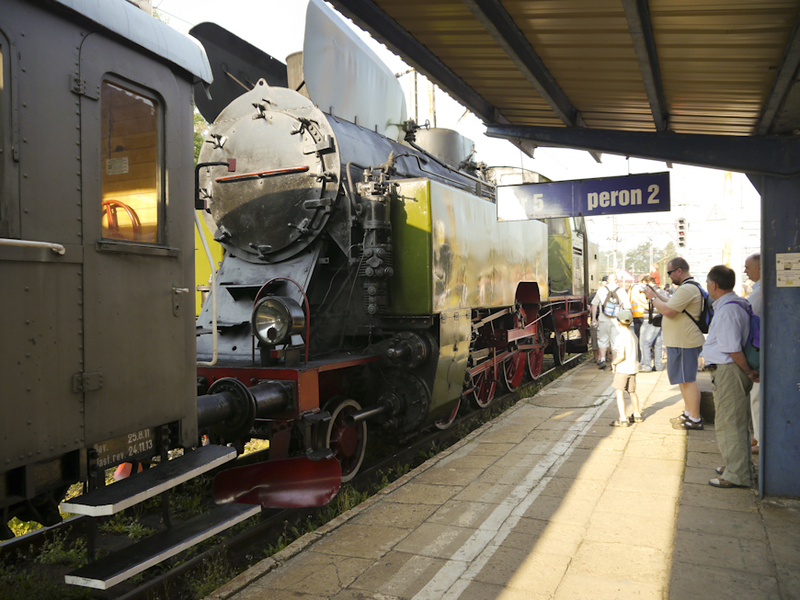 For six years the Stowarzyszenie Hobbystów Kolejowych (SHK, The Association of Railway Hobbyists) have been working to bring back passenger services to the line during the holiday season. Despite the huge enthusiasm of everybody involved, success remained elusive. 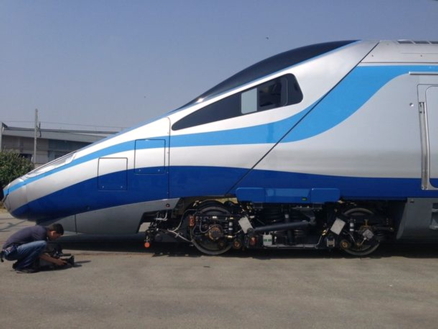 However, with the assistance of SKPL, who provided the rolling stock and technical expertise, the SHK’s dream has become a reality and, after an absence of four years, passenger trains returned to the line on August 15. Because the Wegorzewo District Council have only taken over the line within the boundary of the District, this year service trains will run only on the section of line between Gierloz and Wegorzewo. 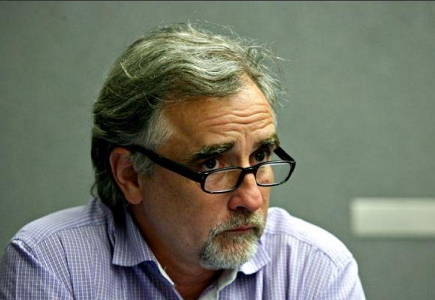 However, it is hoped that next year it may be possible to extend services to Ketrzyn, because the Chief Executive of Wegorzewo District Council has expressed an interest in his Council acquiring the missing section. Come and ride on this nearly forgotten line on the northen edge of Poland’s delightful Mazury Lake District. Trains are running on August 15, 16, 17, 18, ​​24, 25, & 31, and on 1 September. See the time table below.